At Santa Barbara Greenhouses, we have over 40 years of experience constructing beautiful, artisan-quality greenhouses for home gardeners all across the country. We take pride in using the highest-quality parts in our products, and every part is pre-cut and pre-drilled at our factory to make assembly easy and fast. Our beautiful redwood and aluminum greenhouses create an oasis for plants of any kind, and with a line of build-your-own greenhouse kits ranging from modest Standard Redwood Lean-Tos to enormous Deluxe Redwood Greenhouses, we have something for every home gardener. 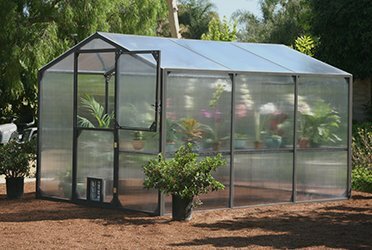 We’re proud to offer three lines of high-quality greenhouse kits for sale, each with its own unique set of advantages. We encourage you to read more below and watch our video that showcases our greenhouse kits. Home gardening is a pleasure that anyone can enjoy, and at Santa Barbara Greenhouses, we’re here to help with whatever you need. We’re proud to sell beautiful, high-quality greenhouses to suit almost any climate, and if you have questions on our products, your greenhouse, or gardening in general, we’re always here to help. Feel free to call us at 800.544.5276 with any questions you may have, or if you’d like more in-depth information on our products, you can request a catalog completely free of charge. We hope you find this information helpful, and no matter where you are in the journey of home gardening, we hope to help you grow beautiful, bountiful plants sometime soon! Our Standard Redwood Greenhouses are perfect for almost any home layout and climate. Made from clear or better California redwood, our standard greenhouses look gorgeous in any backyard, and the durability of redwood means you’ll enjoy yours for years to come. 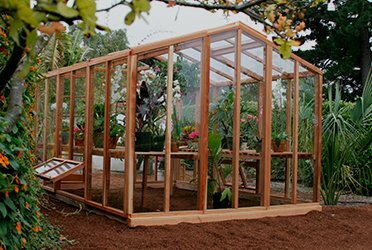 Our Montecito greenhouses use our heavy duty “Insalume” frames, which are designed to be one of the most weather-resistant greenhouse materials available. Combining rugged 16 gauge steel, lightweight & durable aluminum, and our top-of-the-line 8MM Twin Wall Polycarbonate roof and sidings, our Montecito line will grow gorgeous plants in almost any climate and weather. For a greenhouse that’s unmatched in capacity, features, and beauty, our Deluxe greenhouses can’t be beat. 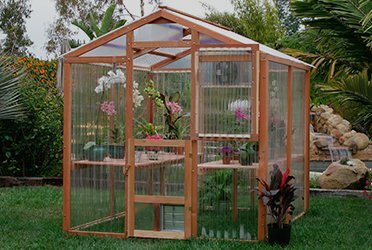 Made from beautiful, long-lasting clear California redwood and using 3/16″ tempered glass panels, our Deluxe model combines durability, weather resistance, and unmatched beauty for a true all-around greenhouse solution. We include detailed, illustrated instruction booklets with all of our greenhouses to make setup & gardening a breeze, but we believe that when it comes to home gardening, knowledge is power! Here are a few tips and some simple information to help you understand more about building your own greenhouse and help you decide which greenhouse is best for you. As always, if you need any help or have questions, you can call us at 800.544.5276. When you purchase any greenhouse, you’ll need a level area to install your kit. You may need to move some dirt around to level the site or you can just spread some crushed rock or gravel over the site to level it off. Even if your site is already fairly level, it’s still best to spread rock or gravel as a base unless you are going to pour a concrete floor for your greenhouse. If a concrete floor is your choice for your home greenhouse, just remember that you’ll need to provide for drainage. Once your site is leveled, you’ll need to perimeter footing or base for your greenhouse. Depending on how permanent or stable you want your greenhouse to be, this can be as simple as 4×4’s or landscape ties well anchored to the ground by a concrete block or as sturdy as poured concrete. If using block or concrete, you’ll need a 2×4 or 2×6 sill attached to the footing. This sill is what you will then attach the greenhouse to rather than trying to attach the greenhouse directly to the block or concrete. Remember, the surface must be true, level, and square for your new greenhouse to fit together and assemble properly. Taking the time to create a sturdy, level foundation will pay off in years of bountiful harvests. Some people set up their greenhouses without water and electricity, and in some cases this is ok. If the greenhouse is only going to be used part time and the weather isn’t too hot or cold, you may not need dedicated water and electricity for your greenhouse. However, if your plants will be in too much direct sun or exposed to cold temperatures, you’ll likely need to power climate controls for your greenhouse. Most gardeners will want water, electricity, and sometimes gas for the greenhouse. A half inch water line into the greenhouse will make watering the plants much easier and provide a source of water for misting systems or drip systems. Electricity in the greenhouse is great for powering fans, heaters, misters, coolers, and lighting if desired. In addition to running a 110V circuit to the greenhouse, you may want to also run a 220V circuit in case you want the option of a higher heating capacity. With 110V you will be limited to 5110BTU heat output, but a 220V line will give you many more options. Some choose to run a half inch gas line to the greenhouse and purchase a gas heater, as there are many more options with gas as far as BTU heat output. This is a good idea for larger home greenhouses, especially in colder climates and if a source of gas is nearby. As mentioned above, you can heat your greenhouse with electricity or gas. This choice will usually depend on the size of the greenhouse and its proximity to electric circuits and gas sources. In most cases, you’ll use a combination of exhaust fans, shading, and misting to cool the greenhouse. In hotter areas, you may consider an evaporative cooler. Some greenhouses have roof and side vents where air is pulled in through the side vents and exhausted out the roof vents (keep in mind that roof vents aren’t very effective without side vents). Other greenhouses are ventilated end to end with a fan pulling air in one end and out the other. Fan size is generally based on the cubic footage of the greenhouse. The goal is to change the air in the greenhouse approximately once a minute. The fan should be placed high at one end of the greenhouse and intake shutters at the opposite end so as to pull cooler fresh air down low and blow the higher hot air out. The fan should be wired to a thermostat to make the function automatic. In conjunction with the exhaust fan, shading the roof, along with the west & south sides of the greenhouse, helps keep it cool naturally. This can be done with shade cloth or screening, lattice, shading compounds that are painted on the greenhouse. Misting is great for cooling the greenhouse and keeping plants happy in hot weather. Misting the greenhouse can be done manually with hose end nozzles, but an automatic misting system set to a timer is much more convenient. The mist system should either run down the middle of the greenhouse or under the front bench rails so as not to wet the plants repeatedly throughout the day, as this can cause fungus problems with some plants. In some cases the mist can be over the bench for seedling starts and germination. Even when weather is humid outside the greenhouse, it can get hot and dry inside the greenhouse.